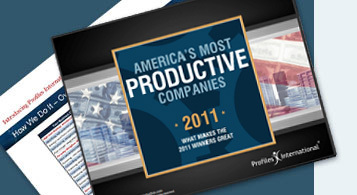 The Profiles Research Institute discovered that America’s Most Productive Companies (AMPC) are likely to encourage an exchange of ideas among employees, managers, and leaders to make the business more competitive. When employees and managers have open lines of communication, employees become more invested in the organization’s well-being. The word “innovation” often evokes images of secret laboratories, major breakthroughs, and home-run products. Most productivity gains, however, are the result of incremental improvements to—and fine-tuning of—existing business processes. Although the home runs grab the headlines, the singles, doubles, and walks can add up to significant gains over time with much lower investment. Open communication and a spirit of teamwork are essential to identifying innovation opportunities. Engagement and productivity actually suffer, however, when the organization sets expectations and then fails to deliver on recommendations. The Most Productive Companies typically do a better job of putting ideas into action than their peers. This is possible because they operate with fewer employees and continually innovate. As we mentioned before, they typically add employees only when absolutely necessary. Management is attuned to improvement opportunities and leadership makes investment decisions quickly when a compelling case can be made for investing in new opportunities. In short, innovation is everyone’s business, not just that of the R & D department. After all, it’s important to have engaged, motivated employees in every department. Create performance-driven cultures where actions and results speak louder than words. Proactively identify and develop effective front-line managers. Innovation results from incremental improvements to-and fine-tuning of-existing strategies and processes.